Xeric plants, once established, can grow with less water, tolerate drought, and are suited to the arid conditions along the Columbia River, east of the Cascade Mountains. This region receives less than 10 inches of rainfall each year. Choosing plants that tolerate the hot and dry summers uses less water, and requires less irrigation and less maintenance. Homeowners who wish to learn about their options can view plants in low water use gardens in the area. The WSU Chelan County Master Gardeners began developing this Community Education Garden in 2010. The garden is located at 1100 North Western Avenue in Wenatchee. It is an outdoor learning environment for demonstrating and teaching sustainable gardening practices. Read more about this garden. The Chelan County Master Gardeners designed, planted and now maintain a Xeriscape Demonstration Garden in partnership with the Chelan County PUD at Riverfront Park in Wenatchee. We are here spring to fall on Wednesday mornings. Stop by to talk to us. The garden can be accessed by parking at the Fifth Street Ice Rink parking lot and walking south along the Apple Capital Loop Trail. Located between the path and the Columbia River and near the Nile Saunders Miniature Steam Train station, this display includes over 40 different varieties of low-water-use plants. 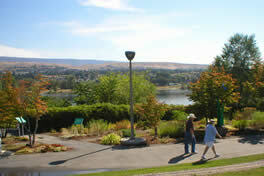 Visit the Chelan PUD Xeriscape website. In 2004, the Douglas PUD planted landscaping showcasing low water use plants at the entrance to the PUD headquarters at 1151 Valley Mall Parkway, at the north end of Parkway, just off Sunset Highway. The Chelan Master Gardeners assisted in the garden design and plant selection. Visit the Douglas PUD website to view a list and photos of the plants in the PUD landscape. The arboretum includes 40 species of trees in the park of the Chelan County PUD dam located seven miles north of Wenatchee and on the west shore of the Columbia River. The extra value of this arboretum at the Rocky Reach Dam is viewing mature specimens of these tree species. The website includes a brochure that lists the trees and a walking guide. This garden displays how to use native plants in an urban landscape. Designed in 2009 by the Wenatchee Valley Chapter of the Washington Native Plant Society, the garden is at the entrance to the Okanogan-Wenatchee National Forest Headquarters at 215 Melody Lane, Wenatchee, WA. Master Gardeners designed and Douglas County Fire District #2 maintains a firewise garden next to the fire station on Eastmont Avenue at 4th Street, East Wenatchee, WA. This pocket-sized garden at Eastmont Avenue & 9th Street offers a shady spot and reflects the East Wenatchee’s relationship to it’s city sister in Japan. It is part of the city’s park system.